Focusing on the artist’s impressive map paintings, the exhibition Frank Bowling: Mappa Mundi [Map of the World] presents an overview of major developments in Frank Bowling’s practice, exploring the artist’s engagement with history, migration, memory and representation across a six-decade career. At a time when artists began to question the rigidity of formalist principles and the autonomy of the painted picture, Bowling sought to imbue the medium with complex social and cultural meaning. In his well-known modulated colour abstractions, which are the focus of this exhibition, he invested painting with a modernising awareness of the social, political and geographic transformations taking place around him. The experience of migration and cross-cultural relationships are important influences on Bowling’s painterly inquiry. Born in Bartica, British Guiana in 1934, he moved to London at the age of nineteen just as the city was experiencing a surge in immigration from the Caribbean and other territories of colonial Britain. During his studies and after his graduation from London’s Royal College of Art in 1962, Bowling’s mostly figurative works were shaped by representations of trauma in British post-war painting and the impact of postcolonial culture in both British Guiana and London. In 1966, Bowling relocated from London to New York, where his exposure to a new artistic environment, and in particular, the radical critique of art by black artists in the post-Civil Rights era, challenged him to test his developing language of abstraction. Incorporating a number of works never or rarely shown before, the exhibition at Sharjah Art Foundation presents a selection of the artist’s map paintings that were formative to Bowling’s depiction of new ideas, forms and subject matter. The show also contributes to a complex understanding of the artist’s formal and conceptual exploration of density, opacity, transparency and colour, which has expanded the social and political dimensions of painting. Material from the Frank Bowling archive and films featuring interviews with the artist provide further insight into the development of his practice and the larger cultural discussions he has helped shape since the 1960s. 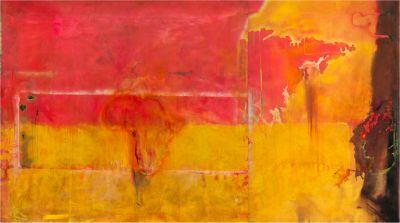 Frank Bowling: Mappa Mundi is organised by Haus der Kunst, Munich in collaboration with the Irish Museum of Modern Art, Dublin and Sharjah Art Foundation, Sharjah. The exhibition is curated by Okwui Enwezor with Anna Schneider at Haus der Kunst, Munich. The Sharjah presentation is co-curated by Hoor Al Qasimi and Okwui Enwezor with Anna Schneider.